location to train station and airport. breakfast included in room rate, excellent croissants. It is France after all. I made a non-cancellable reservation for the wrong date and the hotel allowed me to change the date w/o any hassles at all. Beds were comfy. Like the comforters. Needed more pillows. Should have asked. Toasty and plenty of hot water. Basic, in a lot of ways. No food allowed in the rooms. 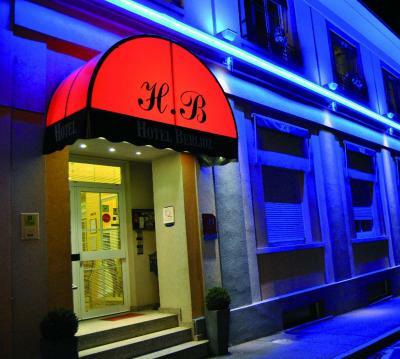 Short distance to the airport and a wonderful restaurant (La Deligence) within walking distance for dinner. Very nice and cozy hotel in Saint Louis, about 10 minutes (and 10 euros) ride by taxi to the airport. We arrived almost at midnight, the receptionist was very kind and helping. He carried our enormous suitcase up to the room and went out of his way to provide a baby cot for our son. In the morning, we had a quick cup of coffee and left feeling well-rested. Will book again if passing through! 5-7 mins drive from the airport. Hotel staff was very friendly and helpful. They spoke good English and were able to accommodate my requests. Traveling alone and not knowing the local language, this was very much appreciated. I was very happy with my interactions with the gentleman at the front desk (he was also kind enough to help with my bags) and with my stay. The room was small but comfortable. It was perfect for me since I was just passing through Basel and needed a place for an overnight stay. But it's also right next to a train station (and close to airport) so overall quite accessible. Location to railway station & bus transfers to airport. Super French restaurant nearby. English speaking staff. The staff were extremely helpful. The young woman in reception when we arrived was very helpful in trying to track down the mobile I'd left in the taxi. Later on the young man who took over reception and had good English tried again. When the taxi driver rang to say he'd found the phone the receptionist made arrangements so we could get the phone the next day. For our stay the hotel was comfortable and quiet. Breakfast was simple good quality continental - the bread was especially good. Great and friendly staff!! Very helpful!! Rooms very clean and the breakfast is very good!! 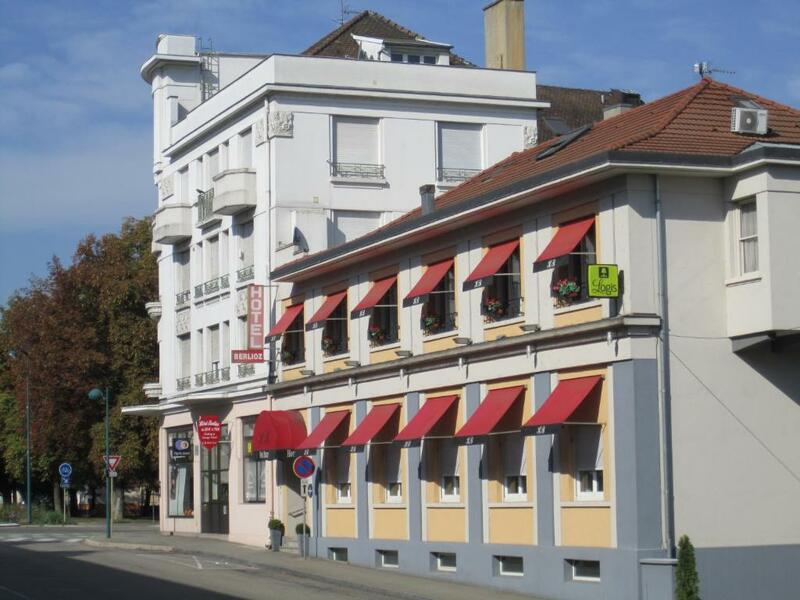 This hotel set near the Basel/Mulhouse airport welcomes you just 0.6 mi from the Switzerland and 1.9 mi from Germany. Le Logis Berlioz features fully equipped and regularly renovated guest rooms, with all the modern comfort. 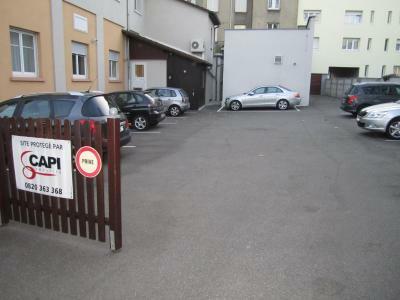 Private outdoor parking and large indoor garage is available on-site. 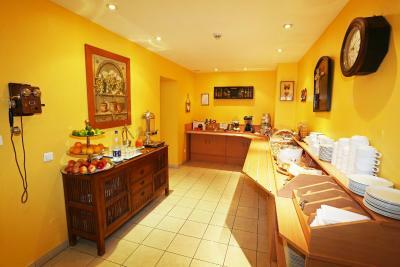 Get a good start each morning with a tasty breakfast buffet, then fully discover this cultural, historic area. 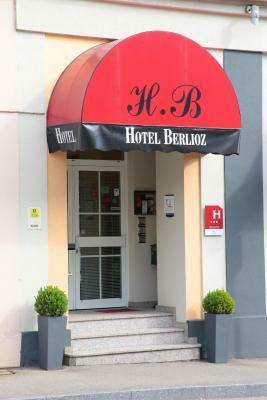 When would you like to stay at Hotel Berlioz Basel Airport? 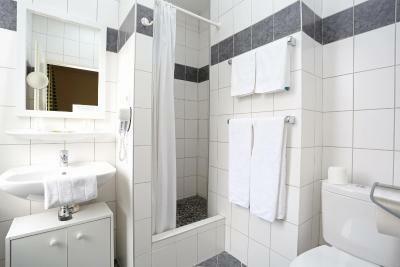 The rooms are simply decorated and include satellite TV and a private bathroom. House Rules Hotel Berlioz Basel Airport takes special requests – add in the next step! Hotel Berlioz Basel Airport accepts these cards and reserves the right to temporarily hold an amount prior to arrival. The Rezeption desk was very unfriendly !!! I told her but she laughes and turned away !!! No airport shuttle available and the bus information the hotel gave me was incorrect. It's bus #11 from Basel, not bus #4! We ended up having to take a taxi that cost 5x the bus fare. I felt at home in the room. they never opened the door/ I didn't stay at all here. Room had very odd lay-out which was OK for one night but would not want to stay for an extended period of time in that room. Only stayed there for 6 hours having to catch an early flight from Mulhouse airport. Room was small and oddly shaped but bed was comfortable and shower nice. Hotel staff was very helpful ! The hotel changes its door code every Monday, what should not have been bad, if I didn't stand with my shoppings at the hotel door on Monday at 12.30, while the reception is closed untill 14.00 and they didn't tell me a new door code. Thiugh the room was rather smallish, it was a nice and quiet room. The hotel is situated right in front of the railway station of Saint Louis. Staff is friendly and they advised me to go to the Petite Camargue, a natural reserve close to Saint Louis, what was indeed very interesting. No Aircoditioning. It was like 25+ degrees in oure Room. Both of us were up all night. Friendly Staff, organized a Taxi in no time. Very good location, staff is really helpful even though tough in English. They booked taxi for early flight . Attentive multi-lingual staff. Very helpful, offering to book places at recommended local restaurants and marking them on a map that we could take away. Also the secure parking was very good. Fans in rooms provided. Also my son left his toy in the room by accident and the staff kindly packed the toy up and returned it to England. Would highly recommend.